This year the Wilderness Preservation Act turns 50. It’s worth remembering that Wilderness Areas were not a given—they were hard-won by a few passionate and determined people. 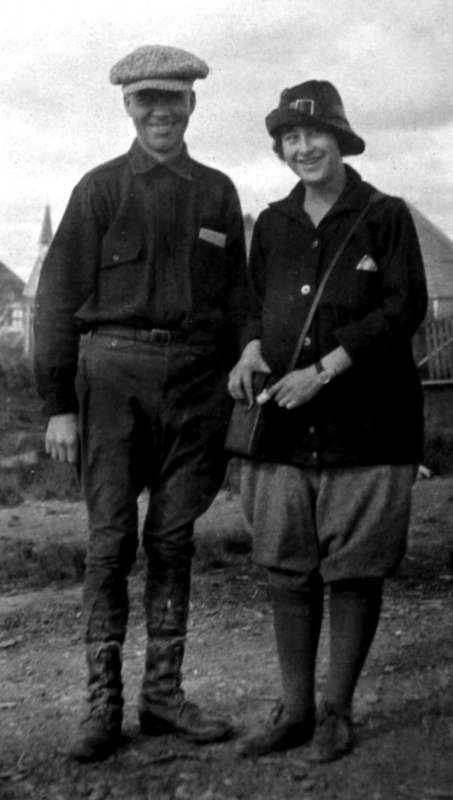 This week’s post is about two people, Margaret (Mardy) Murie and her husband Olaus Murie. Their love of nature—especially the arctic wilderness—drew them together to share a life of adventure and activism. And they both played key roles in the passage of the Wilderness Preservation Act and the establishment of the Arctic National Wildlife Refuge. In 1916, In the frontier town of Fairbanks, Alaska, a fourteen year-old girl was saying goodbye to her mother. She was excited and a bit nervous to be taking her first journey on her own, a trip on the Valdez Trail to her father’s home in Southeast Alaska. 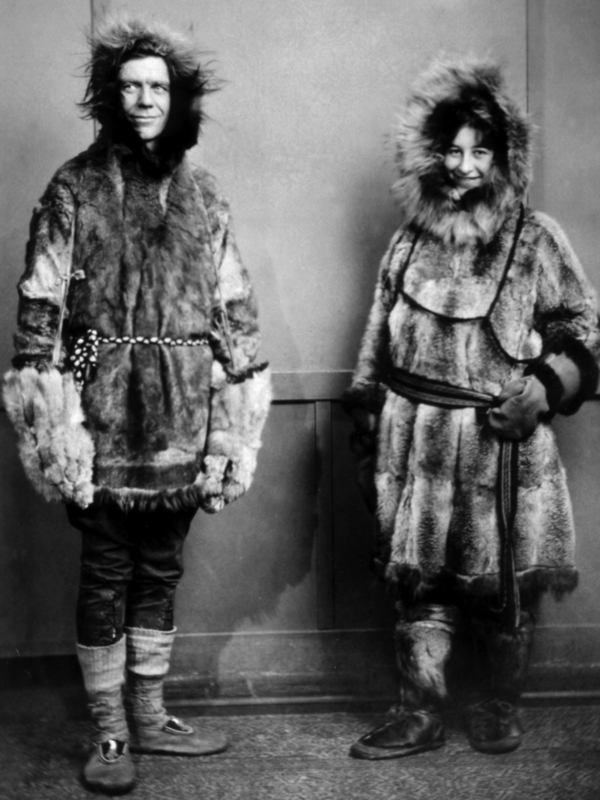 Mardy and her fellow travelers were bundled into enormous wolfskin robes for the trip across the Alaska Range in an open, horse-drawn sleigh. 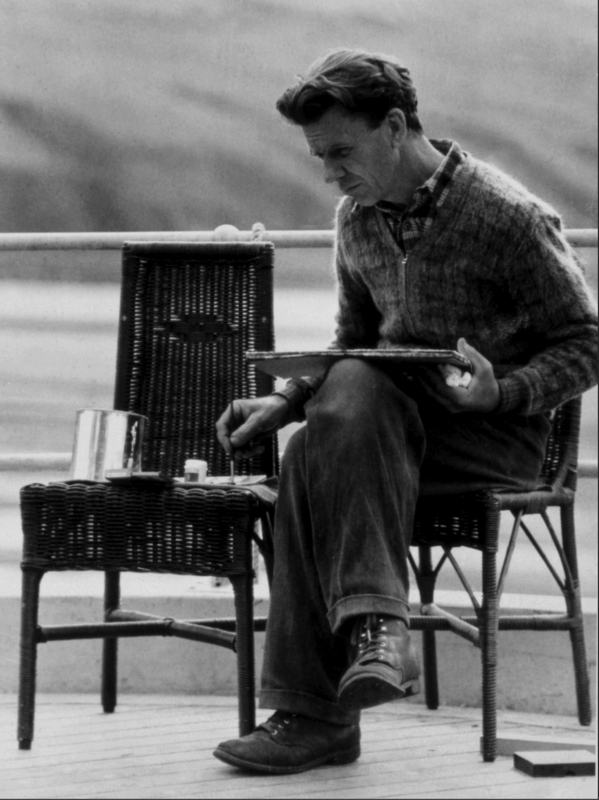 Mostly, they traveled at night when the snow was easier, and they stopped to rest in roadhouses along the way. 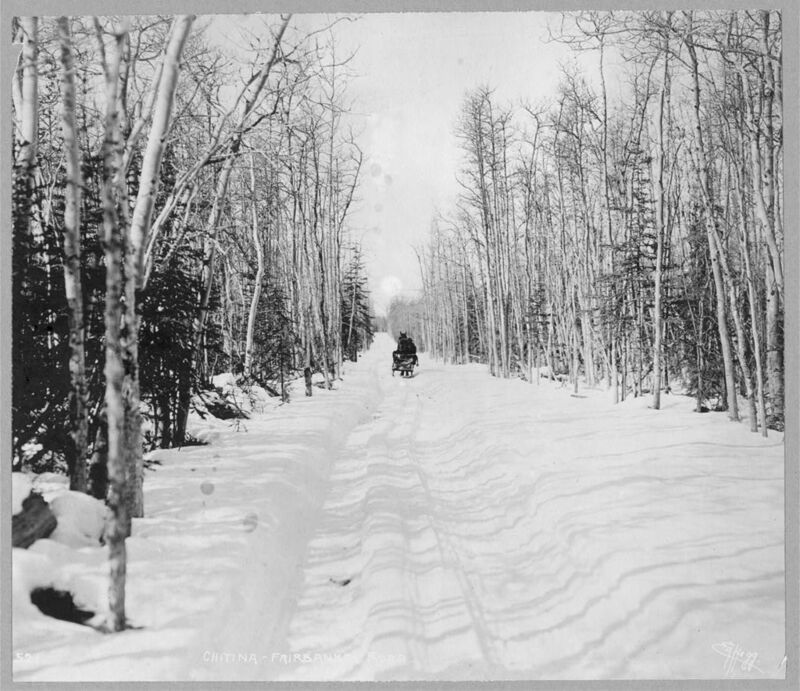 Horse and Sleigh on the Valdez – Fairbanks Trail, 1911-1920. Photo Library of Congress. After what seemed like weeks in the sleigh, she transferred to a wagon, then train and steamship, finally arriving at her father’s island home in Southeast Alaska. It was there, during a summer of exploration and outdoor life in the remote inlets, bays, and forested islands, that Mardy’s love of wilderness was born. To most fourteen year-olds today, spending a summer roaming free in the wild would probably be the adventure of a lifetime. But for Mardy, it was just the beginning. While still in college, she met an arctic biologist, Olaus Murie, a tall, handsome blue-eyed arctic biologist who worked for the U.S. Bureau of Biological Survey (now the U.S. Fish and Wildlife Service). He was doing research on caribou and other wildlife. Olaus was a strong and gentle man who had spent most of his life in wilderness and was an expert in arctic survival, wildlife, and the native language. His interests were scientific, but he was a gifted artist as well, and spent much of his free time in the backcountry drawing and painting his observations of nature. While they were becoming acquainted, Mardy and her mother went to visit Olaus near Mount KcKinley where he was working. It was there that their friendship deepened into love as they spent five days “tramping about in a rosy haze in those enchanted mountains.” The two of them realized they were perfectly matched: a shared love of adventure and wilderness life. 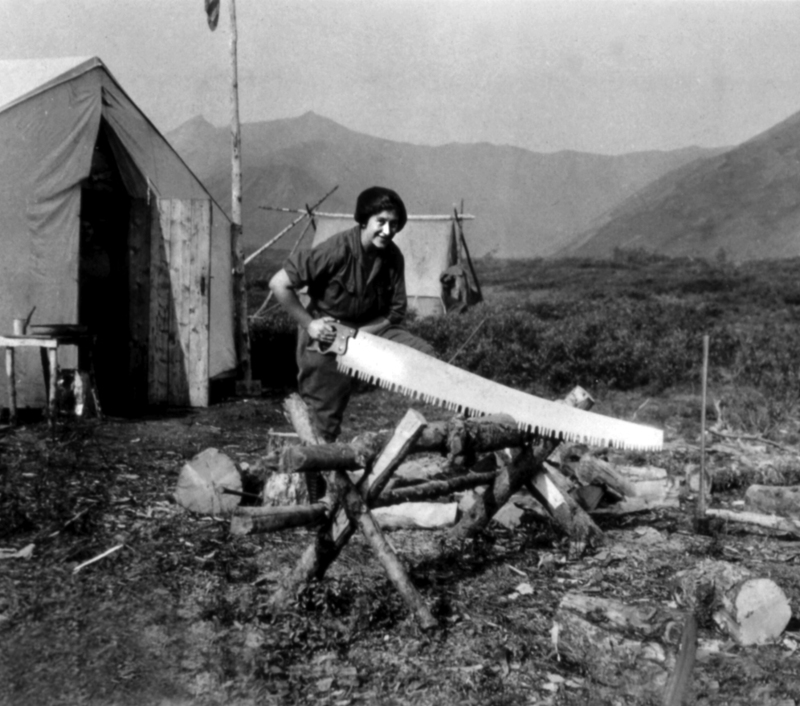 Mardy completed her business degree and was the first woman graduate of the Alaska Agricultural College and School of Mines (now the University of Alaska Fairbanks). She and Olaus married in 1924 in a log chapel in Anvik, a remote village on the Yukon River. Mardy’s mother and the rest of the wedding party arrived to the wedding by sternwheeler. For their honeymoon, the two of them set out on a three-month, 550-mile riverboat and dogsled trip up the Koyukuk River to the Brooks Range, above the Arctic Circle. 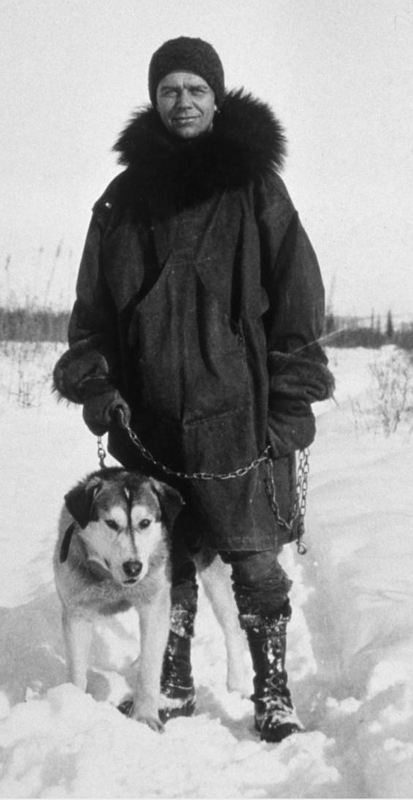 Mardy, dressed in furs and skins from head to toe, had to learn how to mush her own sled pulled by seven Siberian Huskies. Mardy and her dog-team mushing on the trail. Photo U.S.F.W.S. They camped in a canvas tent warmed with elk hides or stayed in shelter cabins. 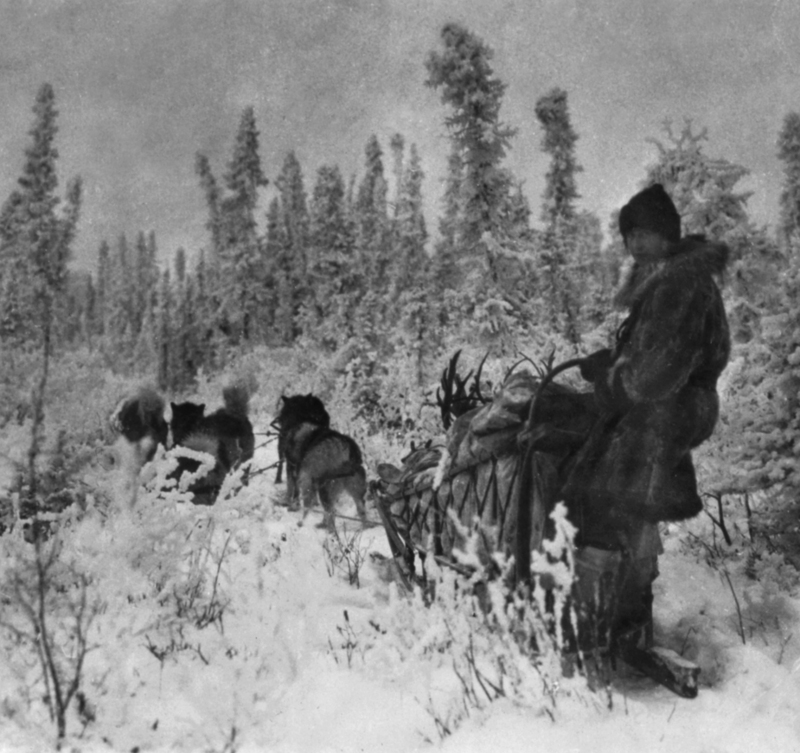 Olaus conducted caribou research and did sketches and paintings, and Mardy wrote in her dairy and fell in love with the arctic wilderness. As their epic honeymoon ended, they each felt they had found their perfect life. From then on, they spent as much time as possible together in the wilderness. The next year, Olaus was sent back to the Arctic to explore the remote headwaters of the Old Crow River. By this time they had their first son, Martin, who was just ten months old. But Mardy had no intention of being left behind, so she packed up the baby and the three of them went on another wilderness adventure. This time it was summer, a season that can be even tougher on arctic travelers than winter, with hordes of mosquitoes, and the warming weather turning the ground to a soggy sponge-like mess below their feet. Instead of mushing a dog-team for transport, they poled up the river in a tiny scow—their crankshaft having broken on the third day of their trip. Mardy made a little tent on the deck of the boat for the baby, where he was tucked securely into a wooden box. But the little family was undaunted by the hardships and challenges of the wilderness. They sang, grew closer, and reveled in the expansive, unspoiled world that teemed with wildlife. Mardy in camp. Photo U.S.F.W.S. At the end of their second trip together, Mardy felt as comfortable with wilderness life as Olaus, and they continued to travel and have adventures—something they would do their whole lives. In 1927, Olaus was offered a position in Wyoming, and the growing family moved to Jackson Hole. Olaus continued his work with the U.S. Fish and Wildlife Service and he and Mardy became key players in the early conservation movement. Among other things, they helped found the Wilderness Society, and had a hand in the passage of the Wilderness Act and the establishment of the Arctic National Wildlife Refuge. They both authored books and won prestigious professional and environmental awards. Olaus died in 1963, but Mardy continued to be active in the wilderness preservation movement until her death at age 101 in 2003. 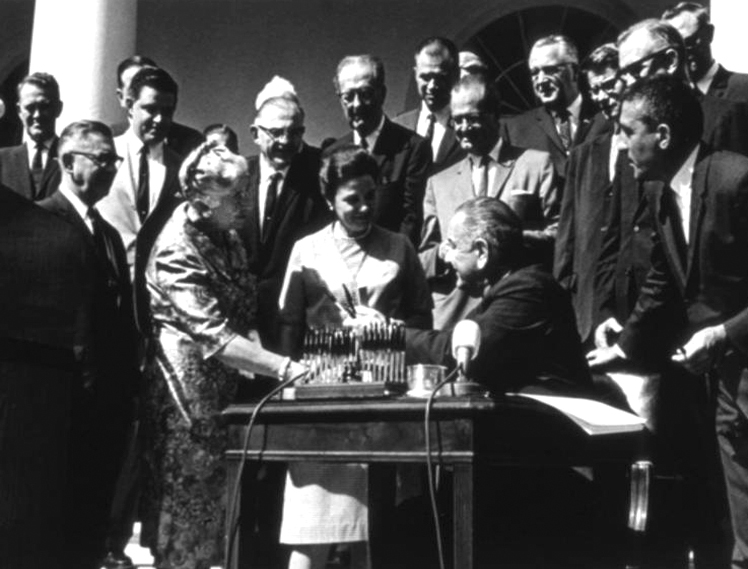 She wrote articles, gave speeches, testified before Congress, and was invited to the White House when President Johnson signed the Wilderness Act in 1964. 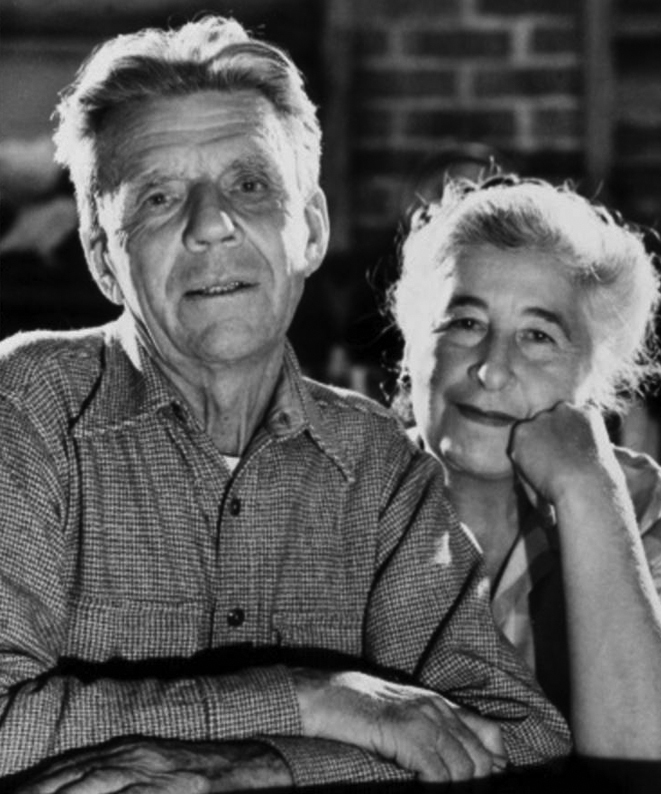 She worked until late in her life, and was dubbed the “grandmother of the conservation movement” by the Sierra Club and the Wilderness Society. Today, the Murie ranch in Wyoming operates as an Environmental Center. Without the passion of committed people like Mardy and Olaus, today our Wilderness Areas might be developed, asphalted, and choked with traffic. The fight for Wilderness is not over. Today, our federal lands are under increasing pressure for oil and gas development, as well as other high-impact uses such as motorized recreation. Do you have any thoughts about wilderness, adventure or preservation? Please leave any thoughts or comments. I love hearing from you! This entry was posted in Environmental, History and Culture, Recent Posts, The Natural World and tagged 50th anniversary of Wilderness Act, alaska, alaska wilderness, Arctic National Wildlife Refuge, History of Wilderness, Mardy Murie, Olaus Murie, the Wilderness Preservation Act by dahndesign. Bookmark the permalink. Yes, the story has everything…romance, adventure and nature! What more could you want? Hope you enjoy it as much as I did! (There’s a DVD too, but I have not seen it) Enjoy! Glad you enjoyed, it Jackson.I’m sure we’ll be hearing more about the history of the Wilderness Preservation Act as the 50th year celebrations get underway. I think, though, that we’ll probably hear more about the victories and less about the struggles. I believe there was a lot of opposition to Wilderness in the various agencies. National Parks, Wilderness Areas—we take them for granted today, but none of them were a given. They were all fought for by people like the Muries. What a cool story – I had no idea. Thank you for sharing! Thanks, Karen. If you’re interested, the book “Arctic Dance” has lots more cool photos and stories. I think they were such an interesting couple. Thank you, Denise, for this lovely tribute to Olaus and Mardy Murie. You deserve a tribute, too, for reminding us of these essential contributors to our present-day (and threatened) world with your blogs. Happy New Year. Your blog was a special new year’s day gift . . . . Thanks, Pat. I’m so glad you enjoyed it! Happy New Year to you, too.